Two years of planning and hard work has gone into the opening of the Creams dessert parlour in North Street, Peterborough. Kiran Sultan and her team opened the doors of her family business three weeks ago and has been overwhelmed by the response thus far at the former Masonic Hall, once home to Clarkes restaurant fronting Lincoln Road. 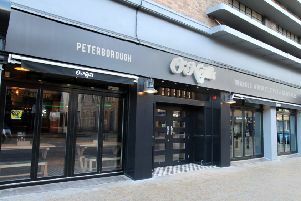 Creams which has opened in North Street, Peterborough. But she insists it has been a labour of love, which started two years ago with the long negotiations to be accepted for the Creams franchise, then finding the right place, getting planning permission for changes and a five-month refit. And around £300,000 later, she insists it was all worth it. “Dessert parlours are very popular at the moment but we felt there was an opening in the market if we could find the right location in our home town,” she said. Being part of a growing franchise meant Creams were very particular about the fit out (a lot of dark pink and black seating) and the food offerings - crepes and pancakes, giant American waffles, milkshakes and probably Peterborough’s largest selection of gelatos. “We were very keen though to have a few bespoke elements in the design to reflect the character of the building though,” said Kiran. “We kept the open firepace upstairs, and we opened up the ceiling to bring both floors closer together and there is a beautiful chandelier.